The seed was sown on 1 June 2002. Denmark and Uruguay were battling it out in their opening 2002 World Cup game in Ulsan, South Korea. The score was deadlocked at 1-1 with just seven minutes remaining in the Group A match. Suddenly there was an opening. Martin Jørgensen crossed in for Jon Dahl Tomasson to glance a magnificent header past the rooted Uruguayan keeper off the underside of the cross bar. The Danish fans exploded in joy and shouts of ‘Kom så Danmark!’ echoed across the stadium. But the joyous moment was not exclusive to the Danes. Some 553 kilometres away in Wakayama, Japan, a small group of Japanese fans were also in the midst of wild celebrations. 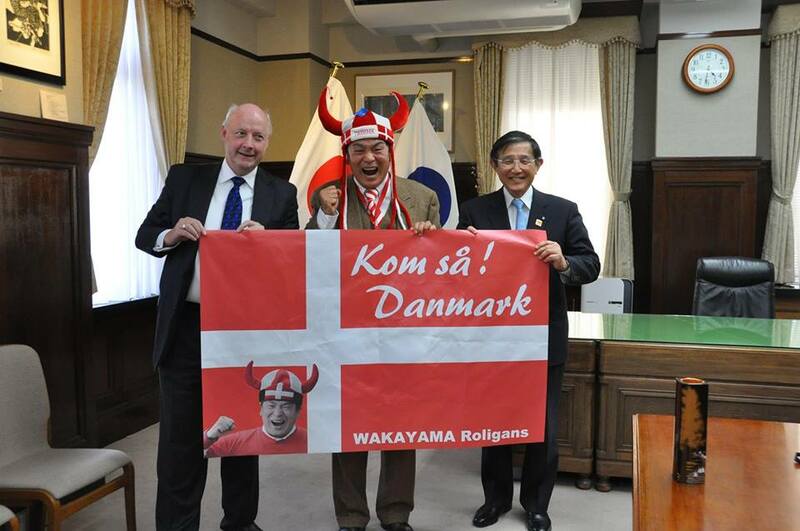 The Wakayama Roligans, Denmark’s most famous fan group abroad, had been born. Well, actually, the seeds were sown a few weeks earlier during the lead-up to the 2002 World Cup, co-hosted by Japan and South Korea, when the Danish team was staying in Wakayama during a training camp building up to the tournament. 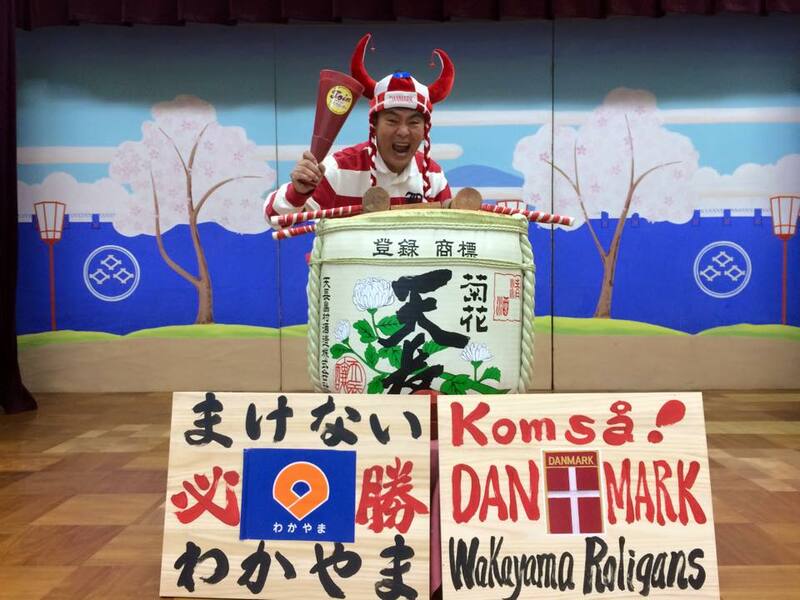 “We made a cheering squad and I became the leader of it,” Keiji Shinke, the energetic head of Wakayama Roligans, told the Copenhagen Post Weekly. Today, the fan group has swelled to include upwards of 80 people from all walks of life. From Yoshinobu Nisaka, the governor of Wakayama, to a 98-year-old grand old lady and ten-year old kids, the fan group is relentless in its support of the red and whites. One quickly understands why when introduced to Shinke. Ever equipped with a Danish flag and Viking fan hat, and constantly bellowing “Kom så Danmark!”, the man an exaberant character oozing passion and spirit. “The most important reason for us starting to support Denmark was that the team was very friendly during their stay in Wakayama. Players like Tomasson and Sørensen were quick to say hi, smile and wave back at us,” said Shinke. The Wakayama Roligans will have even more to shout about next week. Missing out on Euro 2016, the Danish team is back in Japan to take part in the Kirin Cup. No need to tell Shinke. He’s knows the score. He has already acquired some 2-3,000 posters with the Danish flag, and on the back side the national anthem is printed. “It’s typically Japanese in the sense that if they have an interest in something, they go all in. They wear the right gear, know the right names, they sing the songs. And they know more about the Danish national team than I do,” said Svane. Indeed. Recently, the Danish Superliga club AGF Aarhus’ fan site, Morethanaclub.dk, collected over 7,000 kroner from AGF fans to pay for plane and train tickets for Japan’s biggest AGF fan, Kousuke Tobe, to come and see his favourite team play for the first time in Aarhus. Tobe started following AGF in 2002 aged just 12 after seeing club legend Martin Jørgensen play for Denmark during the World Cup. Jørgensen played for Italian outfit Udinese at the time, but that didn’t prevent Tobe from finding out where it all started for the former midfielder. When Jørgensen surprised Tobe while he was being interviewed before the match in Aarhus, he nearly fell over in shock and momentarily seemed to lose the power of speech. Denmark’s best ever player Michael Laudrup is another Dane who is still remembered fondly in Japan. Svane contended that Laudrup was a kind of ice-breaker in a footballing context when he went to Japan to play for Vissel Kobe for a season in 1995. 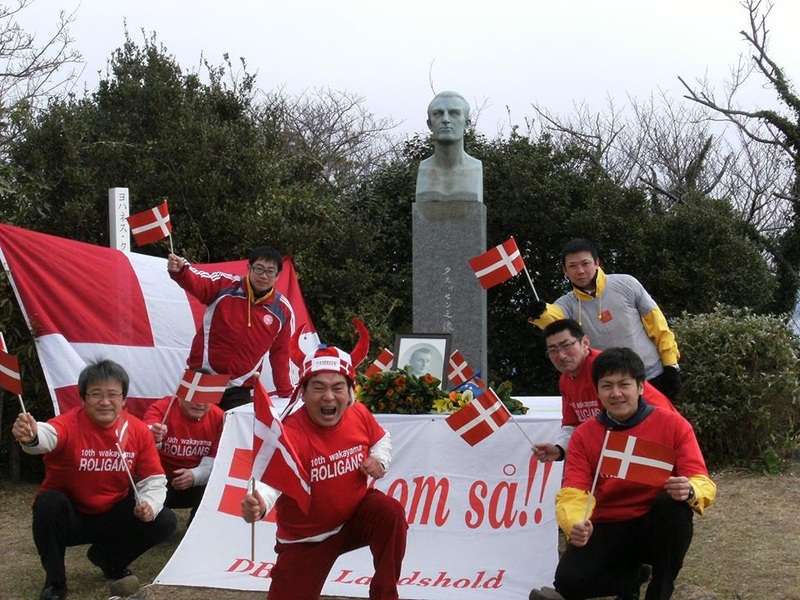 There are Japanese fans who still follow Denmark to this day because of Laudrup. Thanks to the close relationship between the fan group and the football team, Wakayama certainly has a potent Danish connection. Over the past 14 years the city has even hosted an annual ‘Komsa Danmark’ football tournament. But actually, an unlikely link between the city and Denmark has existed for almost 60 years. In 1957, Johannes Knudsen wrote himself into Wakayama hearts and history. The Dane was on his maiden journey as the chief engineer on the Maersk-owned ship Ellen Maersk, when the tanker spotted a small Japanese fishing boat ablaze off the coast of Wakayama. Ellen Maersk lowered a ladder to save the fisherman, but he was too exhausted to climb up. Knudsen instead climbed down to fetch him, but unfortunately both he and the fisherman ended up losing their lives. There is still a bronze statue of Knudsen in Hinomisaki Park near the town of Gobo, located just south of Wakayama, commemorating his heroism that day all those years ago. 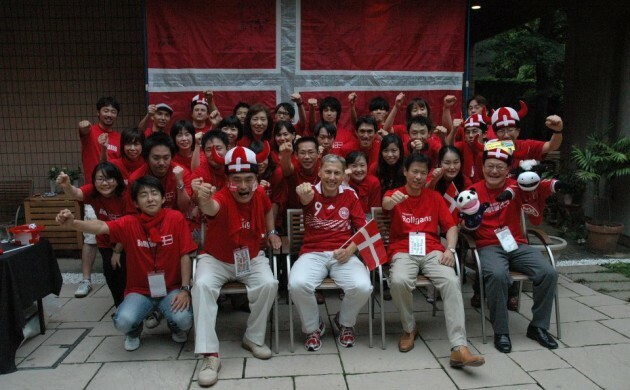 Shinke said that the Wakayama Roligans expect to travel to watch both games Denmark play in. The first will be in Aichi on June 3 (see page 23 for details), while the final and bronze games will be played on June 7 in Suita. The group is planning to take a 30-man bus to Suita, some two hours away from Wakayama, and they may get some help from the Danish football association DBU for the game in Aichi. Jacob Wadland, the head press officer with the Danish national team, revealed that the DBU were trying to sort out some tickets for the Wakayama Roligans. Their support has not gone unnoticed. A similar situation could easily arise next week. Denmark take on Bosnia and Herzegovina in one semi-final, while Japan face Bulgaria in the other. Depending on the results of those games, the Danes could very well run into the hosts in the final or in the battle for third. As was the case in 2010, Shinke hopes for a draw. 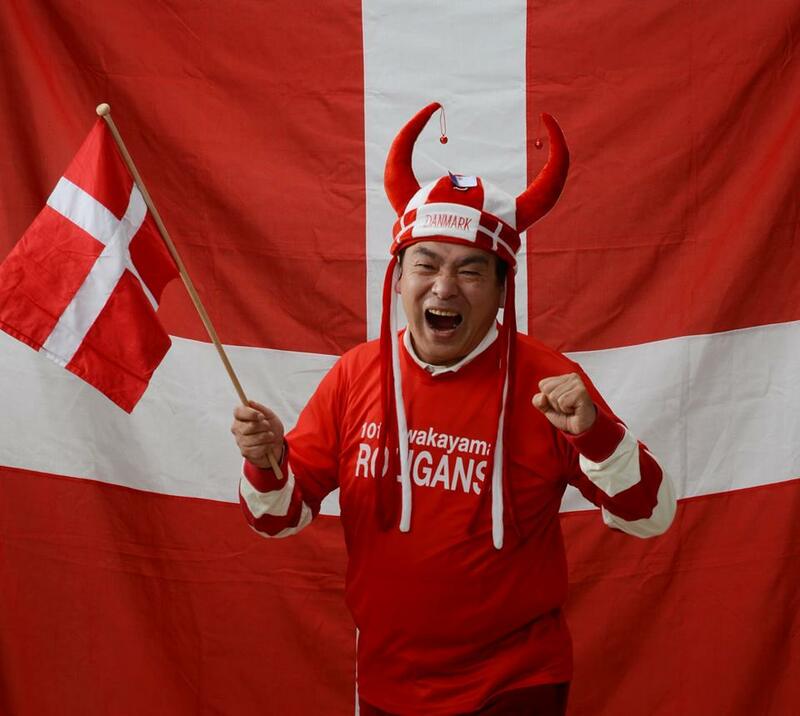 Shinke, who has been to Denmark twice, said he would love to make it to Rio to cheer on the Danes during the Olympic Games, but he may have to settle for watching it on TV if he can’t get a ticket.